OH, HOW hot my poor head is!" 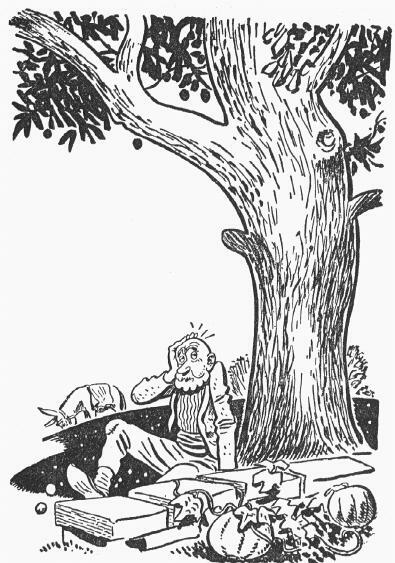 Nasred-Din Hodja sat alone under a walnut tree. He fanned himself with a pumpkin leaf that he had picked from the vine sprawling at his feet. I can take off my turban without anyone laughing at my baldness!" He unwound his turban and wiped his dripping hot head with it. He threw the turban down on the ground beside him, and he sighed contentedly as the breeze from the pumpkin-leaf fan blew on his smooth glistening head. "There, I feel like myself," said the Hodja, comfortable and contented again. "That was a good day's work I did in the vineyard today. I have earned a good supper. Fatima said she was going to cook goat's-milk soup for supper. I'll just rest here a minute to cool off, then go home to a good big bowl to fill me up. With the sense of well-being, the Hodja always felt the urge to talk to someone - to tell of his exploits or to give advice. But he had already made sure that not a soul was in sight. He could hear the tinkle of sheep bells and the reedy whine of a shepherd's flute on the distant hillside, but not a person could he see. The pumpkin-leaf fan waved more slowly, as Nasr-ed-Din Hodja sat erect. The fan dropped to the ground. The Hodja was wide awake again. He had discovered something that really should be changed. "You silly old tree!" Nasr-ed-Din Hodja shook an accusing finger at the walnut tree that was shielding him. "Is that the best you can do? And that? And that?" The Hodja pointed scornfully at the walnuts growing on the tree. up a pleasant excitement. "You rise up so proud and high, but what do you have to brag about - just some little walnuts no bigger than my two thumbs. Take a lesson from your neighbor, the pumpkin vine. It lies along the ground, feeling so humble and unimportant but see what good reason it has to brag." The Hodja pointed at the huge golden pumpkins, snuggled among the dark green leaves of the pumpkin vine. The more he thought about it, the more disgusted the Hodja became with a scheme of things which made little walnuts grow on a noble tree and huge pumpkins grow on a groveling vine. "Now, if I had been planning it," cried the Hodja to his audience of walnuts and pumpkins, "it would have been very different! The big important pumpkins would be waving proudly on the strong branches of this big important tree. The little unimportant walnuts could cling without any trouble to the spineless pumpkin vine. The vine might even hold up its head a little, if it had something the right size growing on it." Unnoticed by him, a gentle breeze had sprung up and was swaying the branches above his bald bare head. "Yes, yes," he went on, "if I had been planning the trees and the vines, you -"
The Hodja never finished his sentence. There was a little snap on the branch above his head. There was a little crackle as something rushed through the leaves. There was a resounding smack as something hit the Hodja's bald bare head. For a minute the Hodja swayed. He saw little bright lights where none had been before. With his left hand he picked up a walnut, small, to be sure, but hard, oh, very hard. With his right hand he rubbed his poor head where a lump the size of a walnut was quickly rising. The Hodja bowed apologetically toward the sacred city of Mecca in the east. "Oh, Allah!" It was a meek and humble Hodja who spoke. "Forgive me for saying you were wrong to have pumpkins grow on vines and walnuts grow on trees. You were wiser than I. Suppose it had been a pumpkin that fell from that tree onto my poor head!" Rubbing his bruised and aching head, the Hodja sat under the walnut tree. He was thinking how beautiful the golden pumpkins looked on their graceful twining vine. They were so close to the good brown earth that they could not possibly fall anywhere. Allah was wise. Allah be praised.